With a leisure and hospitality theme on its stand at ISE 2018, Optoma , the world-leading brand of video and audio products, is presentinga raft of innovative and interactive solutions for the business, education, professional installation, and home entertainment markets. 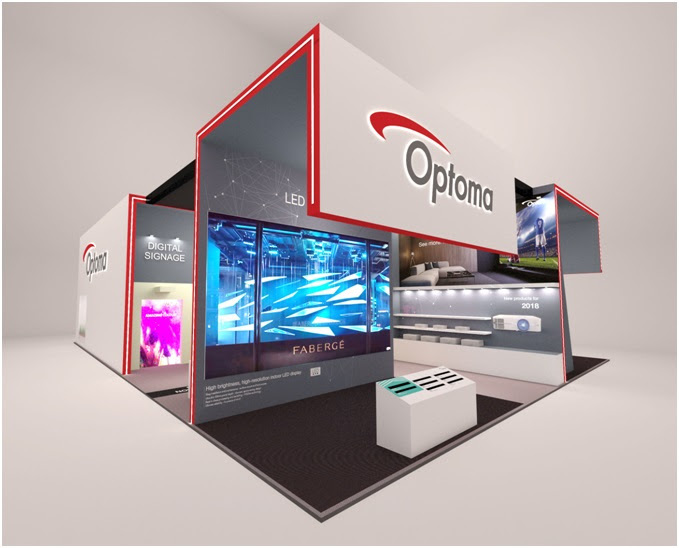 Visitors to the Optoma stand in Hall 1, stand 1-N80, will be among the first to experience Optoma’s latest cutting-edge products including new ultra-bright lamp-less laser and 4K DLP projection, as well as unique demonstrations for both professional AV applications and home users. A huge display features four of Optoma’s new flagship ZU1050 projectors, producing an impressive 20,000 lumens for a visually striking display. This WUXGA projector featuring MCL technology (Multi Colour Laser) forms part of the DuraCore range which combines longer-lifetime light source and an independent IP rated dust certification. Optoma unveils its DOME lens using a 3m diameter dome coupled with the OptomaDuraCore laser ZU850. This ProScene model features WUXGA resolution, bright 8200 lumens and ultimate colour performance. Simple to set up, this cost-effective solution delivers a portable, immersive experience from a single projector with no blending required. The DOME is guaranteed to inspire and captivate any audience. The world's first interactive gaming platform for climbing walls from Valo Motion, featuring Optoma’s 6000-lumen ZU650+ laser projector, can be seen and experienced. This WUXGA model is designed for 24/7 continuous operation in challenging environments, making it suitable for applications where performance around the clock is required. For the first time, this unique 4K animated 3D projection mapped show will be on view for all to encounter. Belgian based company Skullmapping and four Optoma UHZ65 laser projectors will display two different animations – transforming the dining experience, hosted by the charismatic ‘Le Petit Chef’. Optomashowcases its ZH400UST ultra-short throw DuraCore laser projector incorporated into an elevator digital signage solution created by the Schindler Group, a leading global provider of lifts. The ultra-short throw lens provides ultimate flexibility and zero shadowing, perfect for signage applications. Powered by bright 4000 ANSI lumens andDuraCore laser technology, it delivers consistent high brightness for up to 20,000 hours of uninterrupted, low maintenance, stand out projection. Optomaunveils its A16 ultra-short throw lens to allow even more flexibility for professional environments. Compatible with Optoma’sDuraCore laser projectors (ZU850 and ZU1050), the lensprovide high brightness in space-constrained environments, with a throw ratio of 0.36:1. Optoma demonstrates two 4K home projectors at ISE 2018 to include its award-winning UHZ65 4K UHD laser and brand new home entertainment model, the UHD50. With full 8.3 million on-screen pixels, Optoma’s 4K projectors meet the Consumer Technology Association (CTA) requirements for 4K UHD and comply with the CTA High Dynamic Range (HDR) compatible display standards. The new UHD50 delivers the ultimate in-home entertainment with impressive and affordable 4K UHD cinema-quality images. Packed with the latest technology and features, this stylish projector boasts HDR compatibility, HDCP 2.2 support and includes a stereo speaker that provides great audio. Created for home cinema enthusiasts, Optoma’s UHZ65 projector harnesses ground-breaking laser technology along with the same high-end specifications as the award-winning UHD65 - recently awarded 5 stars and ‘Best projector £2000-£4000’ at the What Hi-Fi Awards 2017. ISE 2018 takes place from 6th-9thFebruary 2018 at the RAI Exhibition Centre in Amsterdam. The Optoma stand can be found in Hall 1, stand 1-N80.